Fair Trade tems from Tanzania and Haiti. To request a fair trade item email director@fahunger.org with the ITEM #. This Basket is Handmade by a person in Singida Region of Tanzania. It measures 8 1/2 inches across and sits 4 1/2 inches high. This is a very sturdy basket. 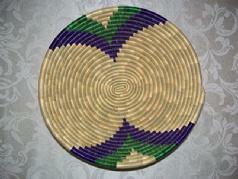 The colors woven through the basket to make a design are green and purple. Recommended donation of $25 plus $7.00 shipping. 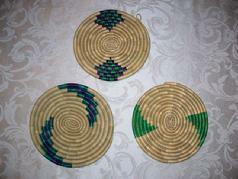 These sturdy trivits are made in Tanzania and measure between 6 3/4 inches and 7 1/5 inches across. They are great for hot pans and bowls. The design on each one is slightly different. These have green and purple weaving for a design. Recommended donation of $7.00 each plus $2.00 shipping. This Basket is Handmade by a person in Singida Region of Tanzania. It measures 8 inches across and sits 4 inches high. This is a very sturdy basket. 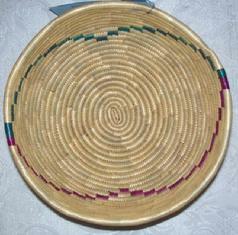 The colors woven through the basket to make a design are wine and green. This basket is handmade by a person in Singida Region of Tanzania. It measures 10 1/2 inches across and sits 4 inches high. This is a very sturdy basket. The weave with purple and green make for a beautiful design. Recommended donation of $30 plus $7.00 shipping. 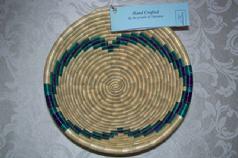 This beautiful woven oval tray with handles will make a wonderful gift. 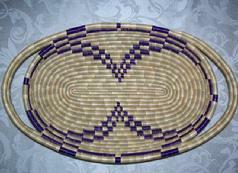 The tray is tightly woven with a purple design. From handle to handle the tray measures 16 inches and is about 9 1/2 across and stands 3 1/2 inches high. This basket is handmade by a person in Singida Region of Tanzania. It measures 10 inches across and sits 4 inches high. This is a very sturdy basket. 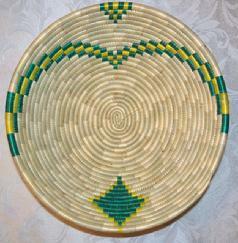 The colors woven through the basket to make a design are green and yellow. This Basket is Handmade by a person in Singida Region of Tanzania. It measures 11 3/4 inches across and sits 4 1/2 inches high. This is a very sturdy basket. 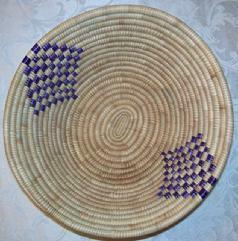 The colors woven through the basket to make a design are purple.